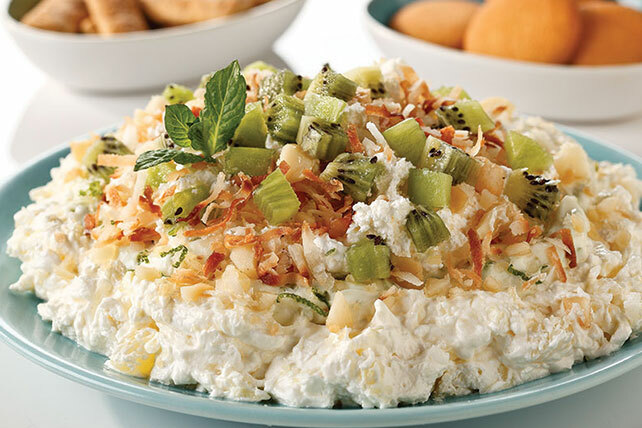 Tropical flavors like pineapple and coconut are what give this luscious dessert dip its name. Break out the cream cheese and prepare to wow the crowd. Beat 4 oz. cream cheese, pineapple and 1 cup COOL WHIP with whisk until well blended; spread onto bottom of pie plate. Mix remaining cream cheese, powdered sugar and lime zest; spread over pineapple layer. Mix remaining COOL WHIP and rum; spread over lime layer. Refrigerate at least 1 hour before serving. Top with nuts, coconut, kiwi and mint. Serve with NILLA Wafers. Substitute 1 tsp. rum extract for the rum. Refrigerate up to 2 hours before serving. Top with nuts, coconut, kiwi and mint just before serving.